Thursday July 18, 2018: Mike has an episode, Carly faces off with Mary Pat, Obrecht fumes over Nina's betrayal, and Maxie figures out where Nina and Obrecht are. Felix looks after Mike at Sonny’s while Sonny argues with Diane on the phone about getting in to see Carly at Ferncliff. Mike notices the photo Julian left, recognizes Charlie, and worries Sonny is in trouble. Mike spins out of control and fears Sonny and Felix work for Charlie. Sonny assures him he works for his son, so Mike begs him to warn Sonny to stay away from Charlie’s place. Sonny convinces Mike that he is his son’s right-hand man, and both he and Felix have been hired to take care of him and keep him safe. Felix gets Mike to go upstairs and rest, and later checks on Sonny, who has never seen Mike that bad before. Felix suggests he consider a home for Mike where he can be cared for, but Sonny can still visit and see him. He agrees to think about it and leaves. 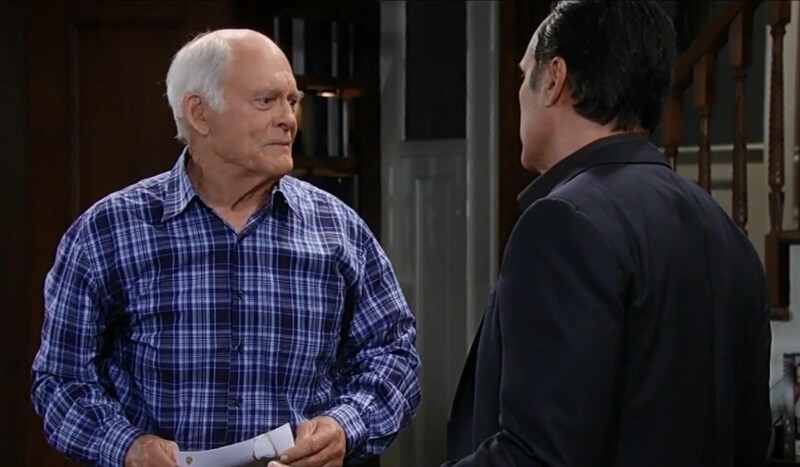 After Sonny is gone, Mike regains his thoughts and worries his son is in trouble. Carly paces a padded cell at Ferncliff when Mary Pat arrives with Rupert. Mary Pat has a sedative prescribed by Dr. Lazarus, who has taken over while Kevin is visiting his wife in Europe. Rupert restrains Carly as Mary Pat plans to inject her. Carly threatens she has people who will avenge her and suggests they take her back to her original cell. Rupert thinks it is a good idea, but Mary Pat scolds him for buying into Carly’s delusions and injects her. Carly warns Mary Pat to remember the name Sonny Corinthos, because he will bury her. Later Sonny finds Rupert and demands to see his wife. Rupert can’t help him and walks off. In her padded cell, Mary Pat taunts a drugged Carly with the phone she found in her room, which is another violation of the rules. At GH, Liz worries to Griffin about Franco, who she hasn’t heard from since he left for the police station. Meanwhile, Sam and Curtis run into Maxie, who just finished seeing Kim. They question her about Obrecht and Nina, and admit they suspect Obrecht has done something with Peter and Nina may know. Maxie is positive that Nina would never be a party to any scheme of Obrecht’s. Curtis reassures her that Nina is his friend too, but they need to find both of them as soon as possible. Maxie admits Nina has been distracted and AWOL from work a lot and moved off of Spoon Island just as it became quarantined with West Nile. She also recalls her very large take-out order she had this morning, and Nina asking her how she’d feel if Peter died. Maxie has to go but promises to keep them in the loop if she hears or thinks of anything. On the docks, Valentin hears Franco moaning from behind some crates. Franco gets up, stumbles out and collapses at Valentin’s feet. Valentin notices the broken bottle and picks a piece up, only to have Chase approach with a gun and order him to drop the weapon. Chase calls for an ambulance as a cuffed Valentin explains this isn’t what it looks like. In the stables at Wyndemere, Obrecht finds Nina trying to free Peter. Nina pleads with Obrecht to release him because it’s over. Obrecht brandishes a Molotov cocktail and states Nina’s betrayal is a silver lining because she owes her nothing anymore, and she can finish things her way. Nina begs her to see that Nathan would not want her to do this, but Obrecht cries that Nathan is buried in the ground while Faison’s other son lives and breathes. Obrecht feels it’s time to end Henrik’s story and brandishes Faison’s lighter. She recites the end of The Severed Branch, where Peter waxes about keeping Faison’s lighter as a memento, but possibly having to burn his own life down one day. She lights the cocktail and tosses it at Peter as Nina screams. Back at GH, Curtis gets an alert that Franco’s been attacked. Later Liz rushes to a room where Griffin works on stitching up Franco, who is still unconscious. Chase arrives and asks if Franco has been able to identify who hit him, but he hasn’t. Meanwhile, Maxie returns and asks a nurse about the West Nile scare under the guise that she is concerned for her new baby, but the nurse sees no CDC alerts about it in the system. Later, Franco stirs awake as Sam and Curtis arrive with questions. Liz asks if he remembers who attacked him. Franco admits it was Obrecht. Chase questions Valentin at the PCPD. Valentin claims he has to get to Wyndemere and insists he be allowed to see his lawyer. Maxie heads to the docks and calls for a launch to Spoon Island after ripping down the quarantine sign. Nina screams for help as the stables burn. Lulu wonders why Maxie is intent on going to Spoon Island. Chase warns Michael that Nelle will become dangerous if she figures out this is a trap. Nelle asks someone how to get away with murder. Diane visits a drugged out Carly. Jason wonders if Sonny is trying to find a way to make this his fault.